This is a portion of the text from the Southwest Franklin County Historical Society’s publication, “Greyhound Racing – Grove City, Ohio” first published in 2018. The booklet, along with many photographs, is available at grovecityohhistory.org or at the Grove City Welcome Center and Museum, 3378 Park St., Grove City. The cost is $10. All proceeds benefit the Society. Greyhound racing was first introduced to Ohio in the spring of 1926 by J. Homer Ellis of Wolcott, Indiana. Ellis, before he became interested in racing, was a distributor of automobiles, according to documents at the Greyhound Hall of Fame in Abilene, Kansas. Two years before the Greyhounds arrived in Grove City, thoroughbred racing had been introduced at Beulah Park. The one-time community park was sold in 1922 to a group of businessmen who created a thoroughbred racing association after a Columbus Standardbred track, Driving Park, closed. The first running of the King of Sports at Beulah Park was in 1923. With those two moves, Grove City became the birthplace for both thoroughbred and Greyhound racing  in the state of Ohio. Ellis and three associates, Dr. A. G. Spindler of Chicago, Jack Chambers and a Mr. Parton from Memphis, introduced Greyhound racing to Ohio. A pioneer in Greyhound racing, Ellis went on to open six 5/16 mile oval tracks in Florida, Illinois, Arkansas, Indiana, West Virginia and Ohio. Before coming to Grove City, they took over a Greyhound track in Tampa in 1925 operating under the business name Six Mile Creek Kennel Club. The track attracted 20 kennels, most of which came from the New Orleans area. This helped create a successful winter meet in Florida but there was a problem. Many of those 20 kennels were part of the Owen Patrick Smith organization. The Smith organization was angry with the competition and branded the kennels that left New Orleans for Tampa as “The Outlaw Bunch” saying they would never be allowed to race on a Smith track again. Smith had Greyhound tracks not only in Florida but also in Erlanger, KY, New Orleans, Milwaukee, Butte, Montana and East St. Louis. The Florida kennels urged Ellis to open more tracks to expand racing opportunities and that’s when he looked toward Ohio. It’s believed Ellis decided to build a track in Grove City because nearby Beulah Park was attracting such large crowds. Ellis assumed horse racing fans would also support Greyhound races, a fact that greatly benefitted his new racing effort. According to the Greyhound Racing Association of America, by 1930, many dog tracks had acquired unsavory reputations because of their involvement with mobsters. The major factor was that most betting had to be accomplished using bookmakers and most bookies had links to the mob at that time. Historian Paul Grossman was quoted saying the Franklin Kennel Club was the first Greyhound track in Ohio . He was also quoted in an interview saying he had been told money from the Chicago mob, likely helped finance  the Greyhound tracks in Grove City and West Jefferson. In 1925, Ellis established the Franklin Kennel Club in Grove City, constructing a track and grandstand just east of Broadway where the Our Lady of Perpetual Help School stands today. Racing started the next year. Part of the land was originally a large apple orchard. A canning factory was located on the property near Columbus Street. Many of the apple trees had to be cut down and removed to allow for construction of a second access road to the track from Columbus Street. At the same time Ellis was building the track in Grove City, he was opening another new facility known as the Thornton Coursing Club in Homewood, Illinois. The Grove City Greyhound track first saw racing Sept. 4, 1926 and 43 race days later, the track closed on Oct. 26, 1926 because of inclement weather. Racing continued the following years until 1928. Racing through 1927 was drawing 4,000 to 5,000 race fans daily, many of whom attended thoroughbred races at Beulah Park during the day and Franklin Kennel racing at night. A race held Oct. 8, 1927 recorded over 7,000 race fans in attendance. Merrill Blair, one of the Greyhound racing legends, started his career with a kennel of dogs at the Grove City track. During the time, many famous Greyhounds were kenneled here including one known as “Traffic Officer”. The track was a big hit that year, but by 1928 racing and gambling issues began to rise at the Ohio State House. Some legislators viewed the track as an illegal activity and wanted it shut down. Others felt the track wasn’t paying the state its fair share from wagering. More than 600 Greyhounds took part in that 25 night meet in 1928, the same year a mechanical electric rabbit was introduced. The “rabbit” was nicknamed “Rusty” and the phrase “Here Comes Rusty” was frequently heard from the grandstands as the Greyhounds rounded the track heading for the home stretch. The track originally used live rabbits for the dogs to chase. Legal issues were not limited to Grove City. Another track operated by the West Jefferson Kennel Club, which opened in June 1928, was shut down by the Madison County sheriff who accused the track of illegal para-mutuel betting in violation of state law. At the time, some of the top $2 bets were paying $18.50 for a winning ticket, a big payout for the day. In 1933, legislation was introduced which allowed wagering at thoroughbred and harness race tracks but the law that passed the Ohio Legislature ignored wagering at Greyhound tracks. Though not confirmed by any written documents, Paul Grossman said Greyhounds raced at Beulah Park at night before small crowds after the track closed. None of the races were advertised and information about the races was spread by word of mouth. Race sponsors didn’t want to call attention to the illegal racing program. Frank Weygandt, of Grove City, was one of the first local residents to race Greyhounds. During his career, he raced not only at Grove City but also tracks in Chicago, St. Louis, Cincinnati and Fort Wayne. Weygandt ended his racing career at the Tampa track in Florida. 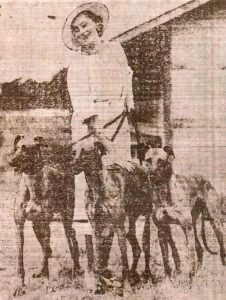 Weygandt had purchased his first Greyhounds in 1926 at Toledo and continued on the racing circuit until 1936 when the local Greyhound track closed. Weygandt had raced at both the Franklin and Union Kennel clubs in Grove City. At his peak, Weygandt owned 40 Greyhounds. Barbara also had another uncle, her mother’s brother, Myron Haughn, who worked at the track. He married the widow of a trainer at the track and he and his wife went on to operate a very successful kennel, racing in Florida and other states for many years. Ellis, who died in 1937 at the age of 51, was described as a gentleman who was courteous to all, a great organizer, leader and someone who was fair to his employees. Ellis is remembered as a man who laid the cornerstone for one of the major sports of its time. When did Grove City High School become known as the Greyhounds? Was it when Franklin Kennel Club operated the dog track in 1926-1928, or was it after Union Kennel took over in 1934? Basketball was the first team sport for boys and girls in 1911 but the teams were not known as the Greyhounds. The first Grove City High School had just opened a year earlier in 1910. After a new high school opened in 1928, the old building at the curve on Park Street became known as the Jackson Building. It has since been torn down. Reading some of the old newspapers of that era would indicate the basketball teams were referred to in print as the ‘Crimson’ or the ‘Crimson and Blue’ team. There is some evidence the name, Greyhounds, was first used in the Grove City Record on Dec. 1, 1927. There are two separate stories of how the name Greyhounds came to identify the school’s athletic teams. One suggests Union Kennel Club made a sizeable donation to the Grove City High School Athletic Department around 1935 urging the athletic boosters to accept the team name Greyhounds. This was the same year the Greyhound track was preparing to reopen the next year after being shut down since 1928. Accounts indicate this was an effort by Union Kennel Club owners to gain public support for Greyhound racing. Their intent may have been to get the community involved in an effort to change the law that would allow wagering at the Greyhound track. Another account seems to be more historically accurate. This account recalls the GCHS athletic department’s need for financial support to purchase uniforms. A member of the booster organization claimed he knew track officials at the Franklin Kennel Club and asked for a donation. The effort paid off and new uniforms were purchased for the boys and girls teams. This might have taken place in the late 1920s about the same time the Ohio legislature was creating laws that governed wagering at thoroughbred and harness tracks. That law failed to mention dog racing. Franklin Kennel, referred to then as the Greyhound plant, donated $2,000 to the boosters. Sports stories, written by Harold Windsor in the Grove City Record in 1927, indicate the name, Greyhounds, was used much earlier than 1934. The earliest reference found to date is Dec. 1, 1927. Prior to Dec. 1, the word Greyhound was not used in newspaper accounts. Instead the newspaper referred to players as “Lads”, and teams as “Crimson” or “Crimson and Blue” when basketball was mentioned. Before basketball season started at the high school, the sport of speedball was a popular competitive activity. That game resembled soccer but it was different. If a player caught a ball in the air the ball could be passed by hand to another team member in an effort throw the ball between the goal posts and score. The name Greyhound was not associated with that sport. The high school adopted the Greyhound team name but community support did little to help keep Greyhound racing alive in Grove City. After five years, the 25-acre Greyhound track in Grove City was being prepared to reopen. According to an article in the Grove City Record, work crews had been at the once abandoned track for two weeks reconditioning the course and buildings. A group of Columbus businessmen, Jonas Pletsch, George Reverman and Danny Cronin, had formed the Union Kennel Club at Grove City in 1934. They planned to challenge a state law that prohibited wagering using public support. Union Kennel was an effort to reintroduce Greyhound racing in Ohio as a major sporting event. Union Kennel Club was short lived operating only nine races each evening for a 25- night stand between June 16 and July 13, 1934. A number of local residents owned and trained Greyhounds at the Union Kennel track. Some were Frank Weygandt, Myron Haughn, Edward (Bill) Karnes, Harold Windsor, Martin (Petey) Baer and Harry Neff. Thirty five local residents were employed at the track. Many young boys also walked dogs to cool them after races. Both Paul Grossman and former Grove City Mayor George M. Haughn walked dogs and both said they were mostly paid with sticks of chewing gum or a few pennies. Haughn said if a handler thought the boys did a better than average job, they got a whole pack of chewing gum. Both boys also walked horses at Beulah Park for the similar pay which often included pennies or a nickel instead of gum. When Union Kennel Club took over the track, the oval was completely rebuilt. A new ramp was constructed in front of the grandstand area. New fences had been installed along with fresh soil for the track. A new electric rabbit system was installed and the grandstands received a fresh coat of paint. The new owners were aware as they prepared to open the track, that wagering was legal at Beulah Park and at other tracks where horses were racing. Unfortunately for the new owners, the law  didn’t include betting at their track. Greyhound track owners were confident they could influence a change in the laws that governed wagering for the “Sport of Queens”, Greyhound racing. Track owners felt they were being discriminated against. They were hopeful local employment at the track would have a significance influence. P. L “Pat” Randall was serving as the general manager at the time and found out the state wasn’t going to change its decision and allow wagering. The racing program at that short meet included outstanding Greyhounds from all over the country gathering for the inaugural 1934 program. Thousands of race fans were anxious for the track to open. One of the first groups of dogs to arrive were shipped from Florida. The 25-night Greyhound meet ended almost as soon as it opened. Union Kennel officials closed the track voluntarily after Franklin County Judge Dana F. Reynolds lifted an injunction the track had obtained, that prohibited Franklin County officials from interfering with the track’s racing schedule. Columbus resident Paul L. (Pat) Randall had been hired as general manager of the Union Kennel Club. He had secured an injunction that allowed the track to open. The injunction prohibited government officials from interfering with the operation of the Greyhound track. Randall signed a lease in 1934 with Robert J. Dienst to open the Greyhound track which Dienst owned. Dienst also owned Beulah Park. Franklin Kennel Club had ceased operation in 1928 because of legal issues with the state over wagering and Greyhound racing in general. Dienst had been a stock holder in the Greyhound track and assumed the $200,000 mortgage on the Greyhound property, according to Paul Grossman. Dienst later purchased the 25-acre property for $12,000, according to an article in the Grove City Record by Jane Schmitz. The state had passed legislation regulating wagering at harness and thoroughbred tracks but the new law made no mention of Greyhounds. Randall, through his attorneys, argued since the law didn’t forbid the operation or wagering at a Greyhound track, then the law, as written, applied only to tracks where horses raced. State and county officials didn’t have the same understanding. Based on that argument and the fact that a track in Youngstown had just been issued a similar injunction, Franklin County Judge Dana F. Reynolds granted a temporary injunction in favor of Union Kennel that allowed the track to open and host races. The injunction prevented Franklin County Prosecutor Donald J. Hoskins and Sheriff Ross E. Anderson from any interference with the track’s operation. The injunction also prevented A. L. Willing, Grove City police chief, and Jackson Township constables, Lawrence DeVaule and Harry Clemons from becoming involved. Bills had been presented in the legislature to legalize Greyhound racing and wagering but none had been voted out of committee. Randall apparently felt the temporary injunction would not be upheld and when he learned legal action, or even a raid on the property, was being considered, plans were made to close. Early races were conducted without any problems. With the return of racing, large crowds made their way to Grove City. Frank Weygandt’s kennel won the inaugural handicap the first night of racing season. His Greyhounds also won several other races that evening. But the Greyhound racing in Grove City was nearing its end. 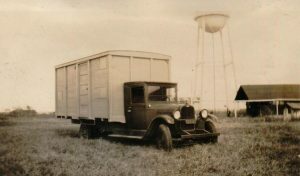 In July, 1934, Judge Reynolds lifted the injunction, as anticipated, and the county sheriff let it be known he would raid and close the facility at the next meet. The sheriff felt Grove City officials should act first but was prepared to move in and make arrests if the village failed to take responsibility. After just three weeks of racing, Union Kennel Club voluntarily ceased operation July 13, 1934. Mayor Orin Breckenridge said Grove City took no action because he was told the track would close without a legal challenge. Through Dienst’s endeavors, the dog track became the property of the Columbus, Ohio, Catholic Diocese in 1959. It later become the site for Our Lady of Perpetual Help School and Church. Thinking back over the years, Grove City resident George Weygandt said in a newspaper article the old track was actually located where the ballfields and playground area stand today at the rear of OLPH. Former Grove City Mayor M. Haughn said in an interview in 2015 that he remembered, as a youth, playing on the grounds at the old dog track. It was a great playground for area children but not necessarily a place his parents would have approved had they known. He said it was overgrown and falling down but it was just the place where a group of boys liked to gather and play. According to an article in a Columbus newspaper in 1936, the old Greyhound track had become a “cops and robbers” and a “hide and seek” playground for neighborhood children. The once popular destination for thousands of Central Ohio race fans was abandoned in 1934 when legislation legalized wagering at horse tracks but didn’t address wagering at the Greyhound tracks. Many fixtures were left in place including several rabbits and the pipe that carried them around the track. The grandstand showed wear and little was left of the kennels; the track area was overgrown by weeds and tall grass. There were some who felt the track could be reborn with a little paint and carpentry work but that never happened. According to the newspaper article, the track was referred to as the “Glamor Gallery of Central Ohio” when operating, and called the “Ghost of Grove City” after it closed. 1 According to a Columbus, Ohio newspaper, Ed McGrath of the McGrath Construction Company decided Columbus would be a good spot for a Greyhound track. He had enlisted stockholders but failed to secure enough backing. Unable to get the local support needed, the newspaper said he contacted men in Chicago for the financial support for a local track. McGrath felt the dog racing was a fad and wanted to capitalize with its growing popularity. By 1927, crowds and betting were on the wane and a storm of protest against Greyhound racing was evident. 2 The Standard breed is best known for its ability in harness racing. 4 The Greyhound Hall of Fame was unable to confirm the Franklin Kennel Club was the first of 3-4 tracks that opened in Ohio in 1926. According to Gary Guccione, the Grove City track “could very well have been the first.” Guccione, an authority in Greyhound racing and history, is a member of the Greyhound Hall of Fame and has been involved with the racing industry since 1965. 5 Grossman’s statement has never been confirmed by a separate source. 8 In the Oral History of Robert Easley, he explained thoroughbred owners lobbied the legislators not to allow para- mutuel wagering after sunset; that was the time Greyhound races occurred. After the competition was out of business, Beulah Park and other tracks started what they called Twilight Racing to capture race fans when they got off work, the group that normally attend dog racing. It was legal as long as the last race got off before sunset.